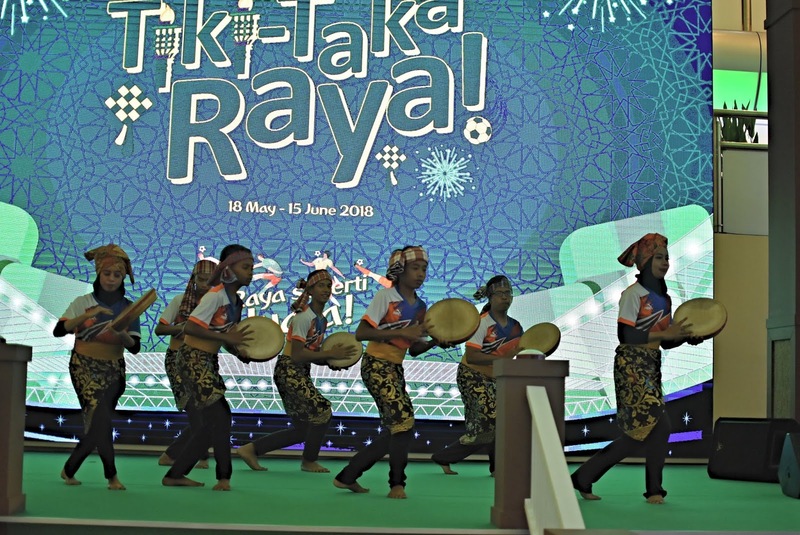 This year, Sungei Wang celebrates the Ramadhan month with the theme Tiki-Taka Raya, an inspiration from the style of football short passing movement and the Raya celebration. 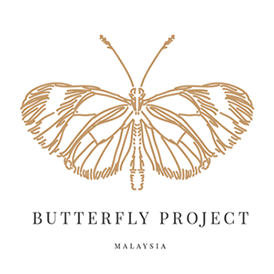 The Raya campaign commences from now till 13 June 2018. During the launching, ChiChi and ChaCha make an appearance on stage and bringing the festive mood to the children from Rumah Anak Yatim & Asnaf Baitul Nurrawdhah. “Football is one of the favourite pastimes in Malaysia. Hence we are taking this unique opportunity to combine both festive celebrations together. When combining football and Raya, we came up with the tagline: ‘Raya Seperti Juara’ to showcase the spirit of champions in how we celebrate Hari Raya. We have maintained our stage decoration with Raya elements through tradition Malay Kampung backdrop and decorated with pelita, ketupat and colourful lightings. At a later stage, we will transform this stage into a football area to usher in the football world-cup event.” says Ms. Yuen May Chee, Complex Manager of Sungei Wang. The event began with a ‘kompang’ performance to greet the guests. 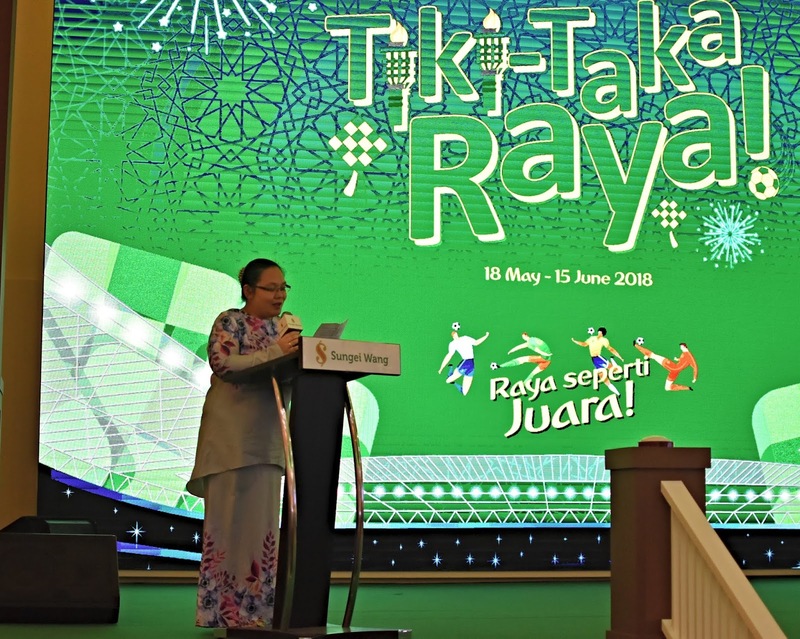 Follow by the official launch of Tiki-Taka Raya by Ms. Yuen and Encik Khairul Anuar bin Mhd Juri (Director of Culture, Arts, Tourism & Sports Department, Kuala Lumpur Tourism Bureau, Kuala Lumpur City Hall). The event continue with a dance performance and presentation of Raya goodie bags to the underprivileged children. The children and guests were also treated with a ‘buka puasa’ session at The Chicken Rice Shop. Catch the exciting Tiki-Taka Raya performances such as Amboi-Amboi Raya Dance, Bro ‘Tiki-Taka’ Appearance, Silat Cekak Performance, Angklung Performance, Kompang Contemporary Music and Classic Acoustic Performance on weekends to enhance your festive shopping mood. The local renowned cartoon character, ChiChi & ChaCha will be brought to life as they will be having public appearance on 3 June 2018. Bring along your kids for a meet and greet session and join them for some interactive games. On 9 June 2018, come and experience a different kind of Raya as Sungei Wang will be having Indie Acoustic Raya with band performances of the local renowned independent bands Shunna, Orkes A Hizadin, Iqbal M. and Oceanlights. The highlight of the Indie Acoustic Raya will be 10 lucky shoppers getting a chance to ‘buka puasa’ with the band members after the event. Stay tuned on Sungei Wang Facebook page to find out more. ‘Raya Seperti Juara’ Raya Packet Redemption. Simply spend a minimum of RM120 in a maximum of two accumulated receipts to redeem collectable ‘Raya Seperti Juara’ Raya packet. Collect all four designs from different weeks! Collected all four designs? Take a creative photo with it and share it on Facebook, the first 30 shoppers will be rewarded with PUMA merchandises worth up to RM100. 1. 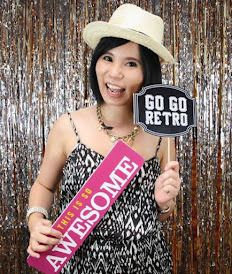 #YourBerbukaOnUs Want to have ‘berbuka’ session here in Sungei Wang? 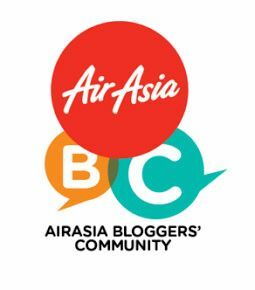 Join the weekly Instagram contest and stand a chance to win meal voucher worth up to RM80. Simply post a food or outlet photo that available in Sungei Wang, tag 3 friends on the post and hashtag #YourBerbukaOnUs & #TikiTakaRaya. 2. Raya Keepy-Uppy Challenge Be the 5 lucky winners and stand a chance to win PUMA merchandises worth up to RM1000. Simply post the most creative football juggling video with Raya outfit, hashtag #TikiTakaRaya and tag 3 friends on the post. Here in Sungei Wang, there is always a good place for your ‘buka puasa’ session. Do come over for more than 40 food and beverages outlets under one roof, you will be spoilt for choices to break fast.